Many of us claim refund in the income tax return. Refund can be claimed by you when the TDS deducted and total taxes paid is more than the total tax payable on income. After the return is processed by the income tax department the refund is processed and credited to your bank account. You can also check the status of refund on ClearTax. In all the above cases a refund reissue request has to be made. Step 1 – Login to Income Tax Department website. 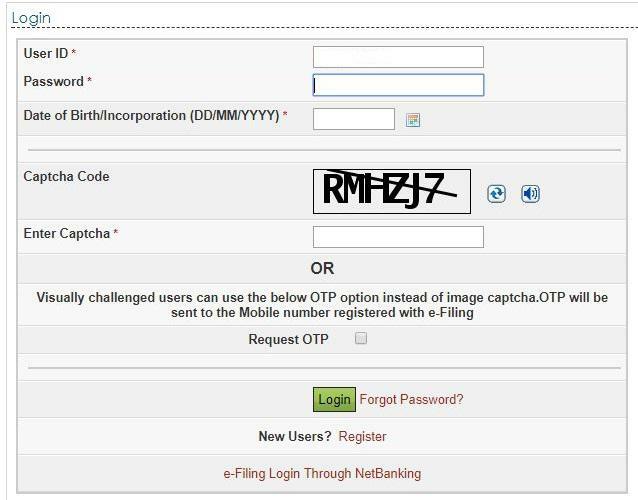 Enter your ‘User ID’, ‘Password’, ‘Date of Birth’ and ‘Captcha Code’. Step 2 – Go to ‘My Account’. In the drop down click on ‘Service Request’. Step 3 – In the ‘Request Type’ click on ‘New Request’, And select ‘Request Category’ as ‘Refund Reissue’. Step 4 – A screen like this will be displayed. Click on ‘Submit’ under ‘Response’ column. Step 5 – Fill in the ‘Bank Account Number’, ‘Account Type’. ‘IFSC Code’ and ‘Bank Name’ and click on ‘Submit’. After a few days of reissue request submission the refund will be credit to your bank account.